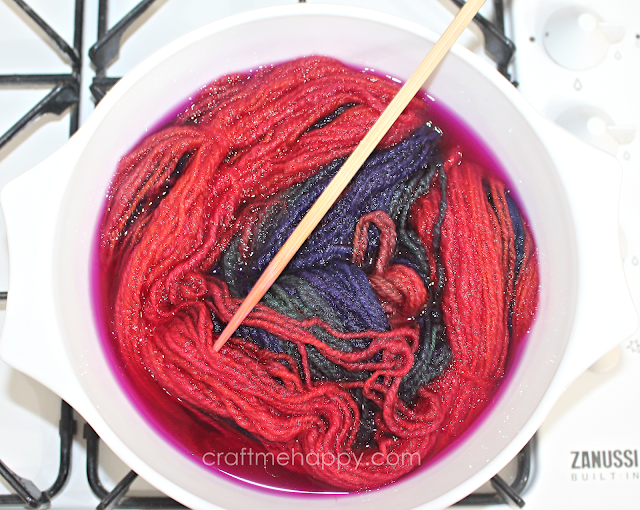 A few years ago my daughter and I dyed some wool tops for me to spin into yarn. To be quite honest, I didn't blog about it because it was a bit of a failure. We used Wilton's food colouring, as it's child safe. Unfortunately, a lot of the colours blended together and so the reds and purples didn't show up at all. 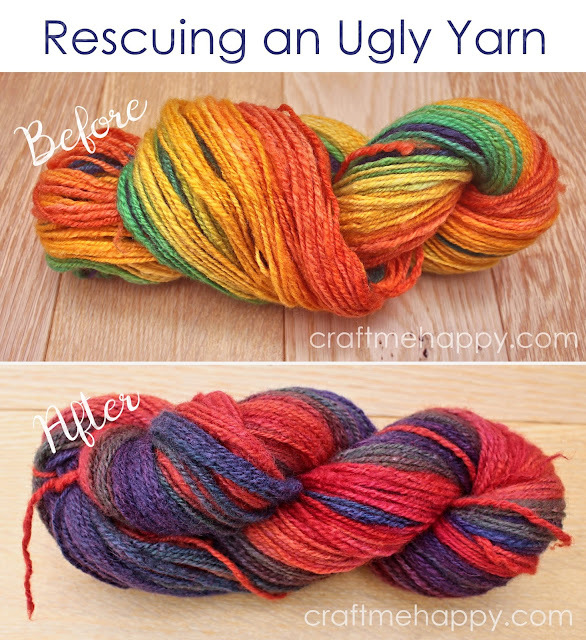 I'm sure there are people that love bright, vibrant colours, but personally, I found the yarn quite hideous. 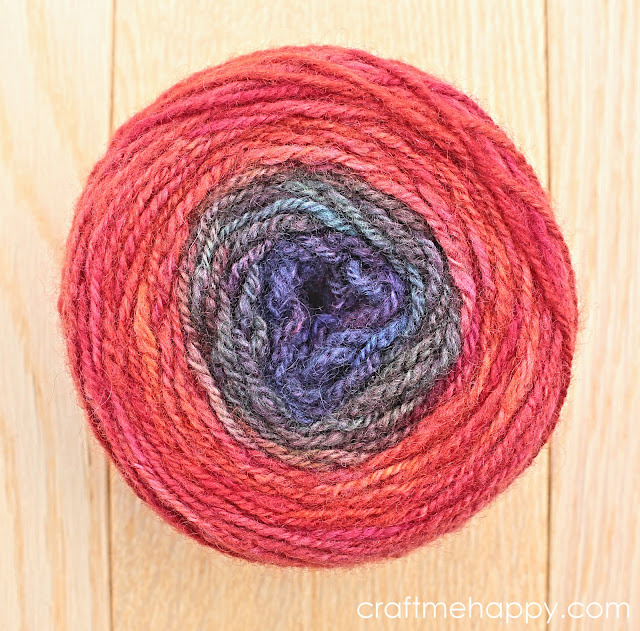 Fast forward to now, and I'm currently trying to learn more about using acid dyes to dye my own wool tops. My other half bought me a Eurolana dyeing kit for Christmas and so I thought an excellent first project would be for one that can't go wrong - it couldn't get much worse. 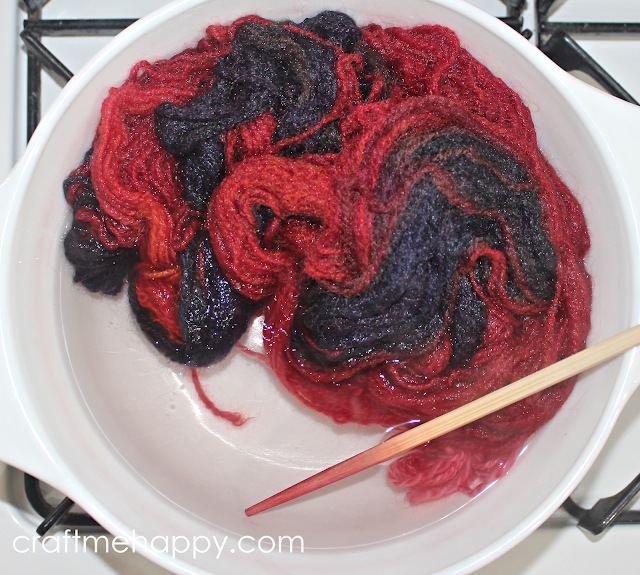 A fellow dyer told me earlier this year that there are no dyeing failures - it just gets darker. This thought has been quite freeing for me in my dyeing adventure. If a dyed project goes wrong, you can always dye it again. I took my 100g of blue-faced Leicester yarn and soaked it for an hour in warm water and Eurolana Wool wash, which came with my dyeing kit. I thought long and hard about what colour to over-dye it with. 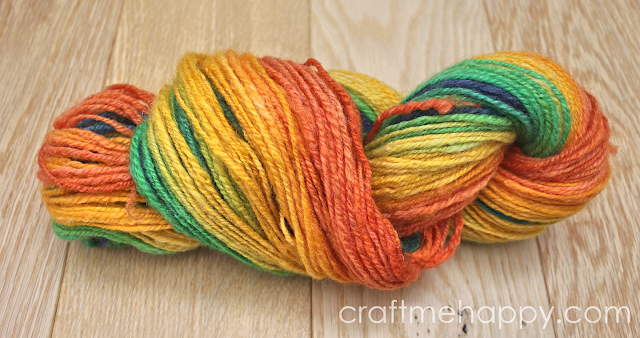 As it's a rainbow yarn I knew that some of the colours would inevitably turn muddy or brown. 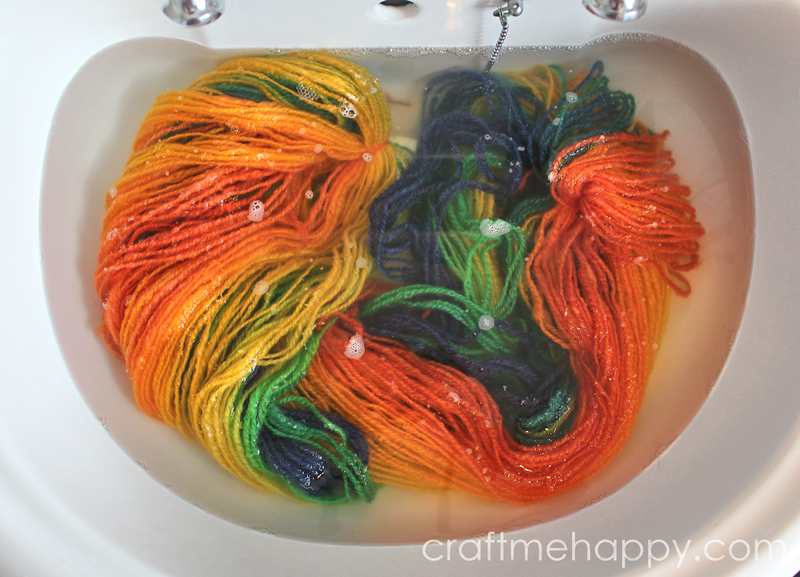 I thought about dyeing it blue, but there was an awful lot of orange in the yarn, which would turn quite an unattractive colour. 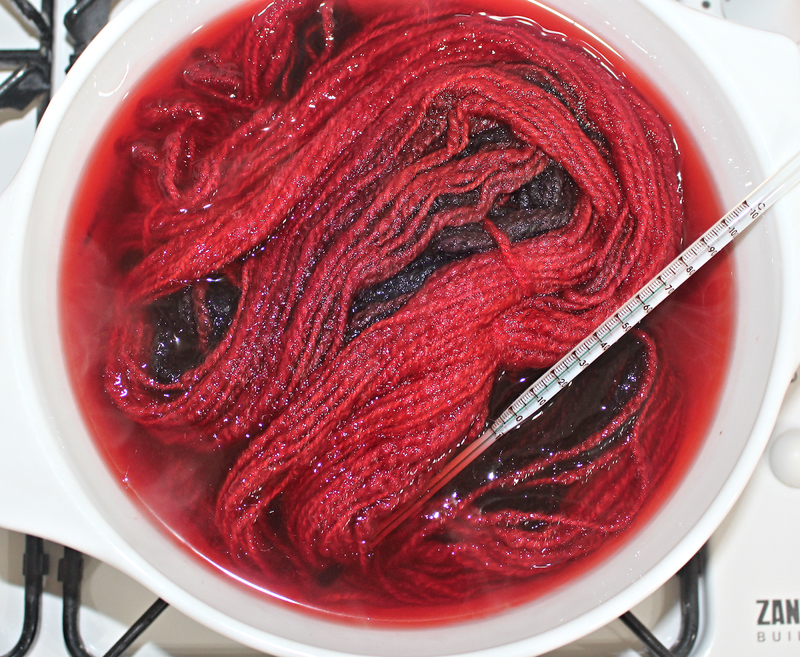 The garish green section of the yarn was quite short, so red was the obvious choice - all of the other colours would hopefully be improved by a red dyebath. I have an old casserole dish that is reserved for non-food craft experiments. In the dish, I dissolved a teaspoon of citric acid in hot water and then filled my dish with enough water to cover the yarn. I then dropped in a teaspoon of magenta dye and gave it a good stir. I gently dropped my yarn into the casserole dish and turned up the heat very gently. After doing a lot of reading about fixing acid dyes, I chose not to use vinegar, as the Eurolana dyes suggest. Citric acid just smells a lot better, you need to use less and apparently it works much more quickly. 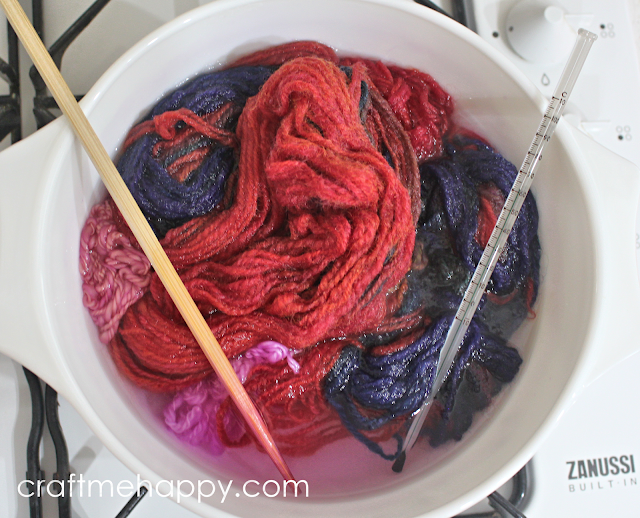 You know when the wool has absorbed the dye when the water starts to look clear. With vinegar, the Eurolana instructions say that it should take 30 to 40 minutes for the dye to be absorbed. My dye bath was almost clear after 15 minutes. I felt that my yarn could take a little more colour and so I removed it and added some red dye to the casserole dish this time. I'm afraid I wasn't taking strict notes on quantities at this stage. I was just having fun and experimenting. Again, my yarn absorbed the red dye in about 15 minutes. I was pretty happy with the depth of colour I had achieved. The greens had turned an olive colour and any darker they would be a definite brown, which I wanted to avoid if possible. Here's my yarn all washed and set. It's still a little bolder than I would normally wear, but I think it's a definite improvement on the original yarn. Here you can see the gradient. Oh, I do love a gradient cake! 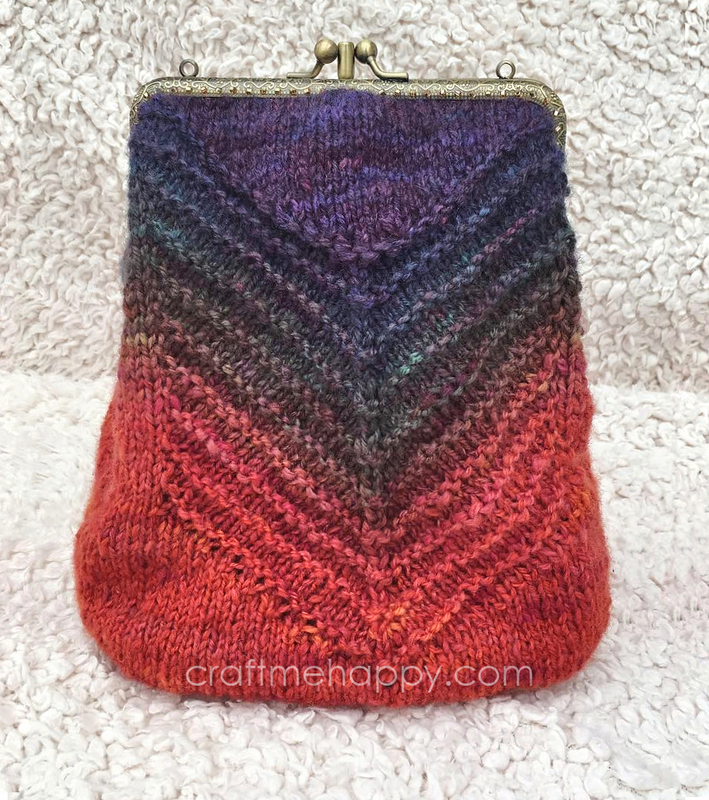 The yarn still didn't turn out to be a colour that I would confidently wear, so I made a cute, bold and colourful purse instead. I love how the yarn that my daughter dyed still lives on, but now with more depth and a lot less ugly! This blog post contains Amazon affiliate links to similar products that I purchased myself to make the cushion. If you click through and purchase, I will receive a very small percentage of the purchase price.